I don't need to introduce the character in today's bento. I believe all of you already know it. Yes, it's the Pig King from the Angry Birds game. I'm not much of a game person. I do play this game on my iPad but mostly my kids played it and finished all the levels. My girl specifically said that she didn't want any 'green rice' on her bento. So back to egg sheet to make this character. I used food picks for the crowns. A quick way to finish this character. Inside the box : chili tamagoyaki, rice, five spice pork mini burger, stir fry bok choy & tofu, and longans. Cute pig king! welcome aboard on the Angry bird bentos..haha..
Yep! Super cool! Thanks for sharing! @James Brooks : Thanks a lot James! This is cute! I like to play Angry Bird too and have completed all the levels... hahaa.. I like your pig king so much! Okay first pig king is adorable! 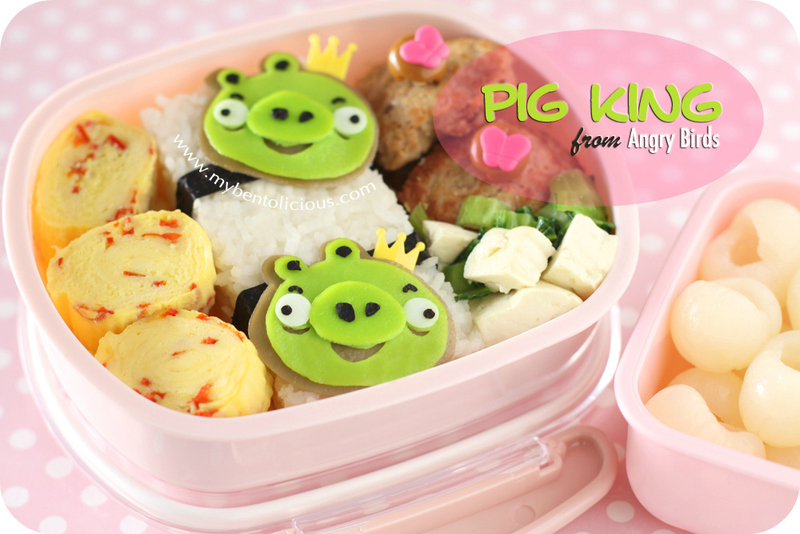 Second I would love to eat this yummy bento! I love hearing about how everything is going with you. Your holidays, schools, family everything! I'll have to check out the Lock & lock sushi box. I am having so much fun with it. I sent my sister a birthday gift and my niece a wedding gift from Lock & Lock. Now I want to see your kitchen organized by them! Really love the pig king, and you got the color so nice! The crown is just perfect too. Love the pig king, so neat! Ah, such cuteness in a bento! Love this Lia. Have also missed your bentos the past few weeks. I have seen and eaten enough restaurant food to last me a few weeks but am now a bit exhausted from traveling to get back to cooking full time. lol. Back to school seems to be on everyone's mind lately (well, moms only). I can't believe the amount of homework your kids have to do.. but with your guidance I know they are acing it! I really amazed on your egg sheet creation. Will try one day for my bento.